It may surprise people to know that Hinduism has a tradition of monotheism that evolved separately and independently from Abrahamic religions. Well, in reality, Hinduism teaches that there is one Supreme Soul (Param-Atma) or Brahman. This Supreme Spirit which takes on many forms, lives in all things, and can also be understood as formless and without attributes (Nir-guna Brahman). This sounds like what Epicureans know as bodies and void–and, in fact, Hindu theology sounds like panentheism (all things are God, and exist within God). The metaphor used by Lord Krishna is that all beings are within Him like beads in a rosary. To speak in Epicurean parlance, Sri Krishna in the Gita is equated with divine Nature. Since there is nothing that is NOT God, all paths lead to Krishna. While Abrahamic religions have historically been violent and intolerant, requiring exclusive allegiance, Hinduism has typically been all-embracing, and has historically exhibited greater levels of tolerance than other religions, even embracing Lord Buddha (who rebelled against orthodox Hindu doctrines) as an avatar, or divine incarnation. Buddhism is still considered to be one of the heterodox dharmic traditions, and some of the Hare Krishnas that I’ve met have told me that they believe that Sri Krishna incarnated as Sri Buddha in order to guide souls with atheistic tendencies. Needless to say, almost all Vaishnavas also accept Jesus as just one of many divine incarnations. This kind of thinking, where different paths are all accepted as right for people of different natures, is firmly rooted in the Gita. The seventh chapter of the Gita says men worship lesser gods according to their inclinations and cravings. Krishna claims credit for whatever benefits one gains from worship of the devas (gods, although many Vaishnavas who have strong monotheistic tendencies translate this as demigods), and says that God takes many forms to please the devotee. Later, in BG 9:23-25, Krishna says that the worship of other gods is worship of Him alone, though not in the right way. BG 9:15 says that “others … worship the Supreme Lord as the one without a second, diverse in many, and in the universal form“, and BG 14:4 calls Krishna the Father who seeds all beings. Other verses are much more unequivocal in their monotheism. In chapter 11, Sri Krishna reveals his never-ending “universal form” to Arjuna in an awe-inspiring epiphany. This chapter could be considered the visionary or shamanic chapter of the Gita. It’s often called the chapter of the yoga of the cosmic vision. In 11:38, Arjuna praises Sri Krishna as “the First / Original Being and God” (Adi-Deva Purusha)–this designation inspired the ecstatic devotional song by George Harrison Govindam Adi Purusham. And so it is clear that the Gita was written, in part, to articulate this native monotheism that emerged among the Vaishnava Hindus, and to assert Sri Krishna’s identity as the Supreme Personality of Godhead. When God is understood as impersonal, God is nirguna Brahman (God without attributes), but when God manifests as a Supreme Person, the Gita affirms that He is Krishna. The God of the Bhagavad Gita plays a unique lila, or pastime / play, with devotees. He takes incarnations, or avatars (literally, descents). The term yuge yuge might best translate as “era after era“, as yugas are considered the Ages or eons. I am interested in this World Savior theory, in part because it is so prevalent in almost all cultures, in part because Epicurus himself was called a Savior by many of his followers–including the devoted Empress Plotina–, and in part because I wonder if the doctrine of innumerable worlds implies that similar beings to Epicurus (and/or other World Saviors) must eventually emerge in other worlds. In other words, if species in other planets eventually develop science and morality at a level comparable to ours, will they naturally produce a great intellectual who will synthesize the physics and ethics (science and morality) of his species into one all-encompassing and coherent doctrine? Similarly, the World Savior theory–seen within the context of religion as a natural phenomenon–raises questions about natural selection. Divine incarnations like King Rama and Sri Krishna were apparently accepted as living gods and perceived as superior beings by enough people, that their cult eventually took over an entire sub-continent. Could they have been singularities, or mutants–beings of such an exceptional intelligence, beauty, or random skill sets that aided in the survival of the species, that the species found it uniquely advantageous to perpetuate their lineage and set them as behavioral examples? And could such beings appear in other species? I am particularly interested in Krishna here, because he is said to have had over 16,000 wives and his beauty was like that of 1,000 Cupids. This was likely an exaggeration, yet seems to indicate that his genes were greatly favored by his society. If he was sought by members of royalty for advise, this seems to indicate that his intelligence was far above average. In fact, Vaishnavas say that Krishna enjoyed “all the six forms of opulence” in maximum quantity. It is impossible to ascertain beyond doubt who Krishna was because so much of his story has been covered up in myths over thousands of years. Krishna is generally conceived of as the Christ of India–except that we find no trace of asceticism in Him. In the theology of Vaishnava Hinduism, he is one of the avatars (descents, or inarnations) of Vishnu, who is the second person of the Trimurti (Hindu Trinity, which is made up of Brahma the Creator, Vishnu the Preserver, and Shiva the Destroyer). The Bhagavad Gita–which is attributed to him–is, therefore, his Gospel, and deals with the various yogas, or therapeutic means to happiness or liberation, that he taught. The content of the Gita is situated in the middle of the Mahabharata, which is the great epic of ancient India. The 18 chapters of discourses were given to Arjuna just before the battle of Kurukshetra. Krishna was serving as his counselor, and (being a diplomat) was supposed to remain neutral in the political affairs, so he gave the opposing party his army while he himself counseled Arjuna’s side. In this manner, he served both parties. Krishna who belongs to Yadava Caste was a folk-hero, darling of milkmaids, and later became a shrewd, flamboyant, manipulative politician among Aryan kings (If at all this is History). His name is used by the parivar of Vedic/Sanskrit scholars, promoted him as Vishnu’s Avatar with divine power and put words in his mouth to implement their agenda through the document “Bhagavad Gita”. If Krishna did live, and was a historical person, then it seems that he was of dark skin. His name translates as The Dark One, or Dark Cloud. He was a cowboy, and was raised tending to cattle–which would mean that he rose to power from the Vaisya caste, or the merchant social class. In his later years, he was the King of Dwarka–a city whose ruins lie today underwater, as attested by archaeology that confirms the traditions that were passed down. If this is interpreted to mean that he probably lived prior to the so-called “great flood” (before the last Ice Age ended and melted great amounts of ice into the ocean), then that would make him much more ancient than 3,200 BCE. 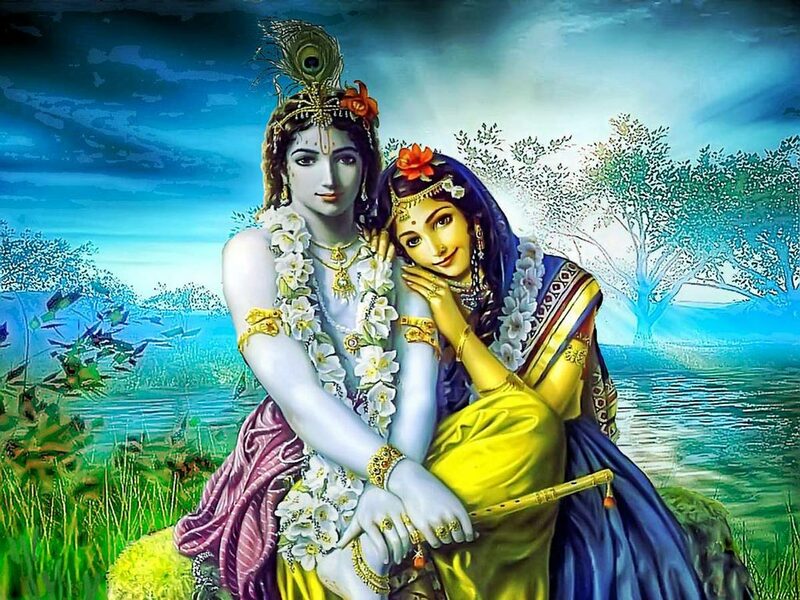 Sri Krishna’s most celebrated lover was Radha, who is seen as his feminine power or aspect. Much more is said about Krishna, but the embellishments are too many and too grand to deserve consideration. My intention here is to point the finger at what I believe might be the tiny, yet interesting kernel of historical truth behind the myth. Beyond this, all becomes theology, myth and speculation, so from here on I’ll stick to the contents of the Gita and my commentary. I will say that I consider Krishna to be, in spite of the many Stoic-like teachings that have been attributed to him and that are perpetuated by the Gurus in the Vaishnava lineage, an essentially Epicurean deity, a god of pleasure and a sort of divine rock-star, a Dionysus of the East–due to his pastimes with Radha and the gopis and gopas in Vrindavan, and his child-like playfulness. As a side note, among the other avatars of Vishnu we find Varaha, a boar who saves the Earth from a demon. Since the pig is a symbol of Epicurean philosophy, this myth or lila is interesting to me. It is interesting to me that Varaha saves and defends the Earth, as we associate the pig with philosophical materialism, and our philosophy seeks to give meaning to this world and to help people philosophize with their feet on the ground and to reconcile their souls with nature. The Vettones were a cattle-herding Celtic tribe from central Iberia known for its sculptures of wild boars, pigs, and bulls. These pigs were known as verracos, a pre-Roman word that is still in use in modern Spanish, and I can’t help to notice the possible etymological connection between verraco and Varaha. This entry was posted in Books, religion, Review and tagged gita, god, krishna. Bookmark the permalink.